The festival commemorates the landing of the first settlers to Barbados at Holetown, St. James in February 1627. It's now in its 42nd year. Highlights of the festival include a street fair, the beating of the Retreat by the colourful Barbados Defence Band Zouave Band, a Floodlit Tattoo parade by the Royal Barbados Police Force and the Mounted Police, many music concerts, lectures on and tours of Holetown, exhibitions, and a street parade that features among other things vintage and classic cars. 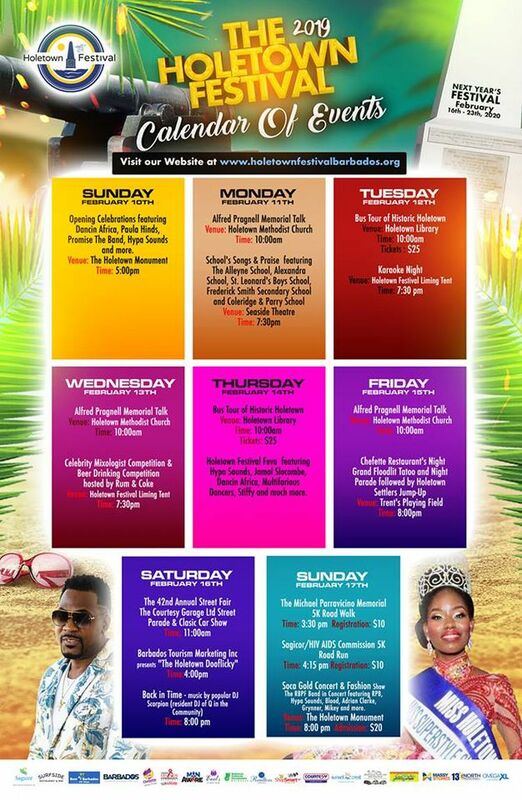 Below are the dates for the major events. 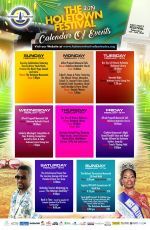 Please check the official event website at https://www.holetownfestivalbarbados.org/festival-schedule for a detailed list of events. The Holetown Liming Tent opens with Karaoke and DJ music. Featuring The Holetown Festival Ambassador Hypa Soundz, Carl "Alf" Padmore, Adrian Clarke and Queen Archibald Cox. Featuring: Hypasounds, Jamal Slocombe, Dancin' Africa, Multifarious Dancers, Stiffy, fire eating, Mudda Sally, Tuk Band and more! T-Shirts (Bds $20.00) available at The Holetown Festival Information Booth. Street Concert featuring RPB, Grynner, Holetown Festival's Ambassador HypaSounds and others. Come and enjoy the arts and crafts at the Festival Art Gallery, classic cars, parades, food and much more. Featuring Vintage and Classic Cars, Bikers, The Barbados Cadet Corp, Dancin' Africa and more. The Michael Parravicino Memorial 5K Road Walk - starting at The Frederick Smith Secondary School and finishing in Holetown. Sagicor/ HIV AIDS Commission 5k Road Run on the same route. Featuring The Royal Barbados Police Force Band along with The Holetown Festival Ambassador Hypa Soundz, Reigning Calypso Monarch Blood, RPB, Adrian Clarke, Gryner, Mikey, Carl "Alf" Padmore and Queen Archibald Cox.